Patricia Kottas-Heldenberg will be our guest clinician for the two-day clinic event as well as our keynote speaker at the Annual Awards Banquet on Saturday evening. The clinic will be held at Apple Knoll Farm in Millis, MA. Patricia Kottas-Heldenberg, because of her family background, has been working with horses since a very young age. 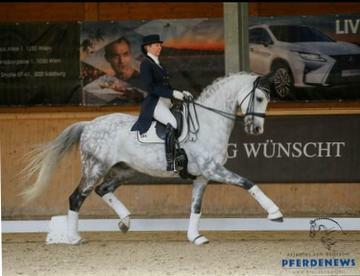 Patricia has been Viennese Dressage Champion at the Junior Rider, Young Rider and Senior Rider levels. She has been focused on the starting of young horses and training them all the way to Grand Prix. Patricia also has many clients who are competing successfully under her coaching. Currently Patricia balances training riders and horses to Grand Prix level at her home stable and traveling all over Europe giving clinics. She enjoys working with riders of all levels. And following in her Father’s footsteps, Arthur Kottas-Heldenberg, Patricia is also very proficient with work in hand. Auditing is FREE!! All are welcome to audit. Auditing is FREE!! Pre-registration for auditing is not required.